Five foreign experts – one of them a Nobel Prize laureate – were granted permanent residence cards yesterday. 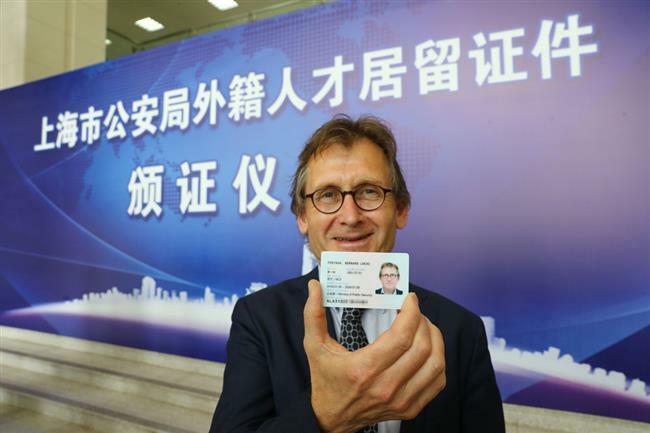 Dutch chemist Bernard Lucas Feringa, a guest professor at Shanghai’s East China University of Science and Technology, displays his newly received Chinese permanent residence card at a ceremony in the city yesterday. Five foreign experts — one of them a Nobel Prize laureate — were granted permanent residence cards yesterday. Giving the residence cards, also known as Chinese green cards, to top foreign professionals is part and parcel of Shanghai’s determination to bring in the brightest and the best to drive the city’s development. Since January, the Ministry of Public Security and the city government have jointly run a program called Juying, or elite gathering, to pilot new exit and entry policies to attract more foreign professionals. This year, the policies include helping foreigners who are core members in leading research teams to apply for permanent residence, allowing experts brought to the city as researchers to also be allowed to be involved in innovation and entrepreneurship projects, and helping outstanding foreign graduates to seek either long-term or permanent residence in Shanghai. The graduates can get a two-year residence permit for their internship here or for entrepreneurial activities, and those who have been working in Shanghai for three years or more have the chance to be eligible for the permanent residence. Dutch chemist Bernard Lucas Feringa, 66, was the Nobel laureate honored yesterday. Feringa, who is a guest professor at the city’s East China University of Science and Technology, is delighted with his new residency status. 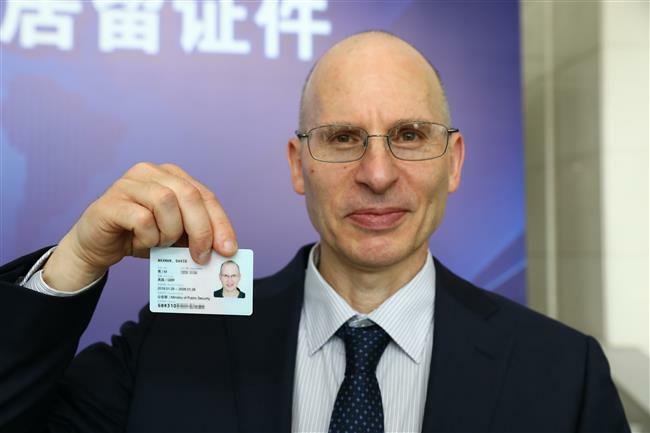 David Waxman, a professor at Fudan University, displays his newly received Chinese permanent residence card. “Now it’s much easier with this card that I can spend more time in China and work together with the people” at the university in Shanghai, said Feringa, who was awarded the 2016 Nobel Prize in Chemistry. Yesterday’s four other permanent residence card recipients also expressed their gratitude at being awarded the cards. “For me that’s actually very important, because I live here in China,” said Roger Kevin Hutton, a professor with the Institute of Modern Physics of Fudan University. Two long-term residence permits were also issued yesterday, to a Chinese-Singaporean researcher with the Chinese Academy of Sciences and to a German graduate at Shanghai Jiao Tong University. Meanwhile, a guideline for the new exit and entry program for foreign professionals was signed by 10 local governments and organizations.